New Balance’s marketing pitch: The desire to feel fast never goes away. Upper: Engineered mesh, inner sleeve, fused laminates. Midsole: Single-density compression molded EVA foam. 6 mm heel to toe gradient. Outsole: Hard carbon rubber on the heel crash pad, softer rubber over the rest of the outsole. 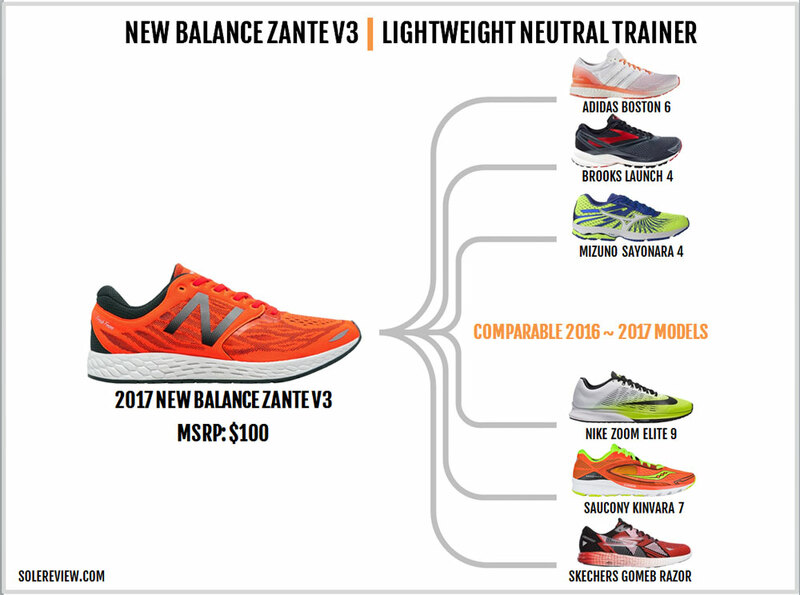 The Zante V3 is an excellent fast training shoe; just not the same as the original Zante. It gets a brand new upper over the V2, with minor tweaks in the midsole and outsole design. There was something magical about the first Fresh Foam Zante. It was light enough to be used for fast runs, and the midsole packed enough cushioning to go the distance. It wasn’t surprising that the Zante quickly developed a cult-like following, building up expectation for the Zante V2. Its sensible $100 MSRP was the icing on the cake. The following year, the V2 showed up in a firmer avatar. While the upper was an exercise in fit improvement, the coveted ride experience of the Zante V1 was lost to time. The V2 was a very competent product but wasn’t the same shoe as the original Zante. 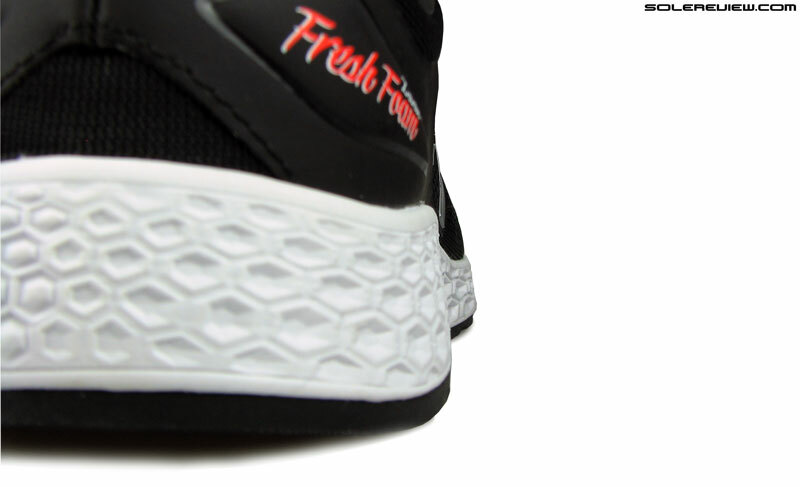 The midsole foam density was firmer and the insole became thinner; this turned the overall ride experience firmer and flatter. So for those of you who missed the feel of the original Zante on the last year’s V2, you’d be curious to know how the latest Zante V3 fares, right? Whether you like it or not, the Zante V3 has more in common with the V2 than it had with the V1. The upper partially borrows design elements from the V1, but as far as the ride is concerned, it feels similar to the V2 and then some. It is actually firmer (by a wee bit) than the V2, which places it closer to the Vazee Pace territory than the original Zante. Both the V2 and V3 are great products which perform as advertised. But hey, so are the adidas Glide 8, Nike Pegasus, and the Saucony Freedom in their own way. The point is that neither the V2 and V3 possess the ride flavor which got people hooked to the Zante V1 in the first place. Why does this happen? Why do brands make abrupt changes to a shoe which was working so well? There are a couple of good reasons. First, making new footwear models involves very long lead times. Eighteen months is what it takes for a shoe to journey from its sketched concept state to the retail store. This means that it is nearly impossible for any feedback obtained from the Zante V1 to be incorporated into the Zante V2. To make this clear, let’s explore the shoe-making process from a timeline perspective. 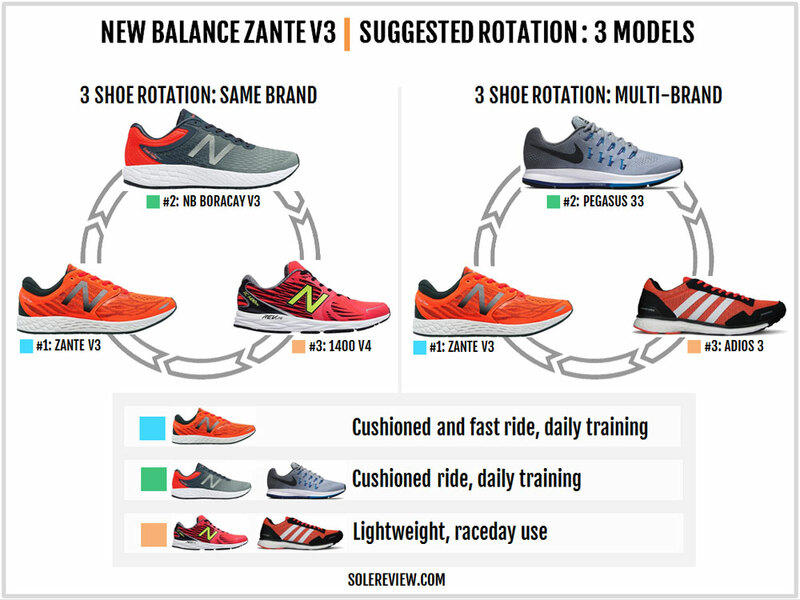 The Zante V1 was officially launched in March 2015, but to simplify this exercise, let’s assume that the Zante V1’s launch date was January 1st, 2015. Taking the 18 month lead-time into account, the Zante V1 was first conceptualized on July 1st, 2013. Approximately, six out of those eighteen months is spent on manufacturing and related logistics, which means that the wholesale retailers/stores first got to see the Zante V1 around July 2014, following which they placed their bulk orders. 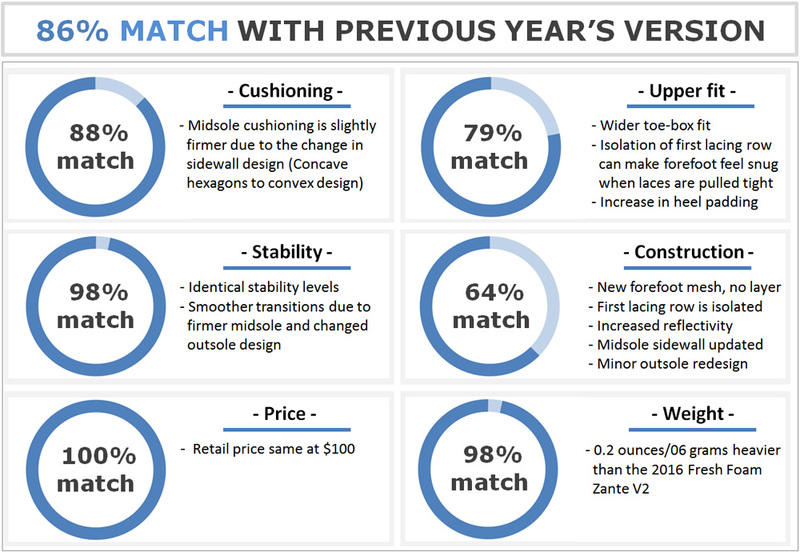 Once the Zante V1 went on sale in January 2015, one would need at least six months of product feedback, so that point in time would be July 2015. The Zante update has a yearly cadence, so going by the same timeline, work on the Zante V2 (launch January 1st, 2016) would have begun on July 1st, 2014, with the finished design (salesman sample) ready by July 2015. If you’re keeping track, this is when you have around six months of customer data for the Zante V1. Considering that the Zante V2 sold to retailers in July 2015, it is impossible to include any feedback from the Zante V1. In fact, even the Zante V3 will not get a full year of Zante V1 feedback. A complete feedback loop will only be available during the Zante V4 design process. In other words, brands are flying blind when designing the second (or successive) edition of any shoe. Changes are made just for the sake of it because the product team has no way of knowing how the market will respond to the first version. As ridiculous as the entire process sounds, this is how brands wing it each day. This isn’t just a New Balance phenomenon, this applies industry-wide. So now you know – it is no coincidence that you often discover that a brand messes up your favorite shoe, and then fixes it in the third or fourth year, if at all. The second reason is the feedback collection process itself. Data which is used to inform footwear design has an unorganized approach, led by a lot of manual curation and interpretation. The fate of a shoe also depends on the individual designer and the team associated with the product. Currently, there isn’t an IT system which effectively captures historical best practices to guide the design process simultaneously. This is why brands make the same mistake over and over again, a footwear equivalent of the Groundhog Day – a never ending loop of repetitive events. Some players in the industry use a generative design approach driven by software algorithms, but those are limited to specific use-cases only. Each year, a brand will pick a design theme which usually cuts across its line, or a part of. This is done so that the entire collection is visually cohesive and appears bound by a common design language. Based on what we’ve seen on the Vazee Pace V2, New Balance’s theme for 2017 seems to be the use of fabric midfoot panels with woven details. Instead, the forefoot is made of engineered mesh with a vented structure on top and a denser weave on the sides. Except for the small reflective strip on top, the entire forefoot is bereft of overlays. The toe-box gets its shape from an internal bumper. We must add the V3’s forefoot breathes better due to its well-ventilated engineered mesh design. A thick midfoot panel with raised detailing is stitched over the midfoot mesh; this panel also extends to the rear where it wraps around the heel. The side logos are now reflective, something which was not on the V2. 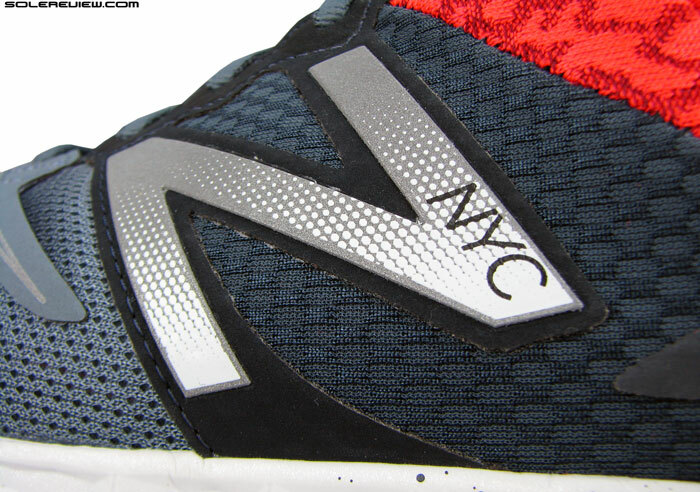 Reflectivity is also found over the heel, where an ‘NB’ logo is fashioned in a shiny manner. The tongue is attached to an inner sleeve just like the earlier Zantes, which translates into a secure fit with no tongue slide. However, the tongue is a bit short. Because if you use the last row of heel-lock lacing, you’ll discover that the tongue length isn’t adequate for the occasion. The design of the lacing area merits our attention. Whereas all the eyelets of the Zante V2 were part of a single synthetic strip, the Zante V3’s lacing is split into two. At the very front is the first row of lacing which is situated independently of the midfoot panel. It is placed directly over the forefoot mesh and is reinforced with heat-fused lamination. If you remember, this is how the Zante V1 was designed too. The first lacing row was over the forefoot, and this affected the fit quality back then. The only difference is that the Zante V3’s first lacing row has a milder design; the V1’s laces were connected to a thick synthetic strip over the forefoot. The V3’s lacing eyelets are debossed into the midfoot panel, and also, the top part is thicker than the Zante V1 and V2. There’s a sense of increased material near the top when compared to the earlier Zantes. Another change happens over the tongue top. The new Zante does not feature the piece of foam-backed synthetic seen on the Zante V2. While the flat, semi-elastic laces are the same as the last year’s design, the V3’s simplified tongue design allows greater lacing top-down pressure to be passed through. The heel collar lining material is the same as last year, though we sense a slight increase in foam padding. 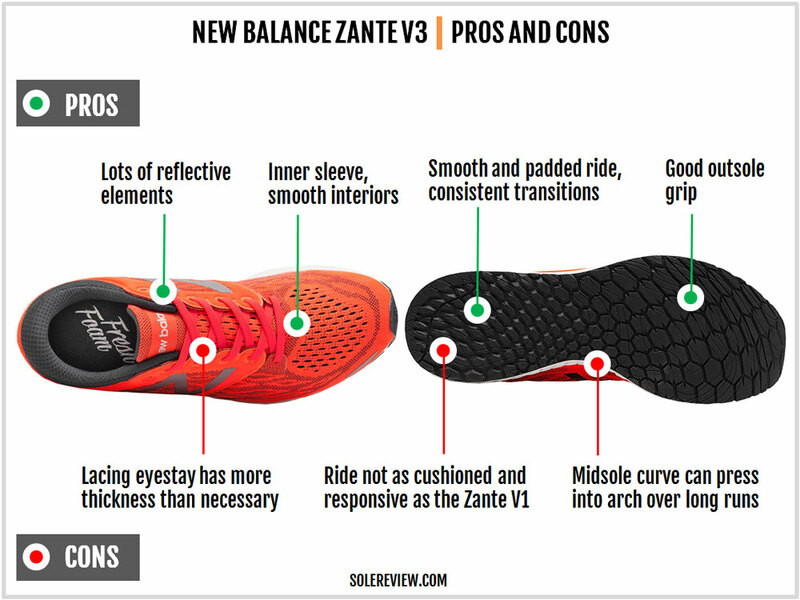 We could very well be imagining it, but the Zante V3’s heel seems plumper than the V2. The Zante has always had a simple midsole and outsole design, and that hasn’t changed in 2017. The midsole is made of single-density foam from heel to toe, and attached underneath is a flat-profiled rubber outsole. The midsole sidewalls have hexagonally shaped molding details which are similar to the V1 and V2. Except that the configuration of the molding has been updated on the Zante V3. 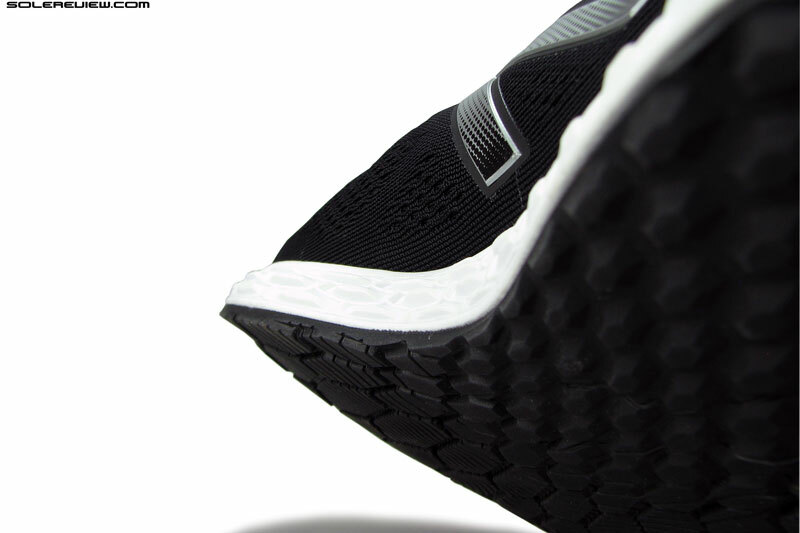 The outer side of the V2’s midsole had depressed hexagons, whereas the V3 has raised hexagons. On the medial side, both the Zante V2 and V3 has raised hexagons, except that V3’s design now has larger hexagons. And what impact do the hexagons have on anything? As explained in our original Zante review a few years ago, depressed hexagons are easier to compress (under weight) than raised ones. With most of the Zante V3’s outer midsole switching to raised hexagons, the ride quality turns slightly firmer than the V2. The V2 was already a firmer version of the V1, and the V3 moves up on the firmness scale. The V3 also features the thinner (and molded) insole from the V2 which was half as thick as the Zante V1’s insole. 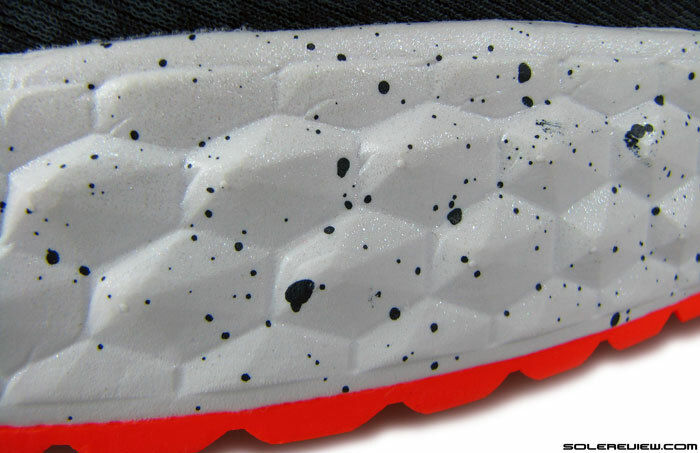 The foam lasting below the insole is also the same, so there’s no change in the upper cushioning layer. 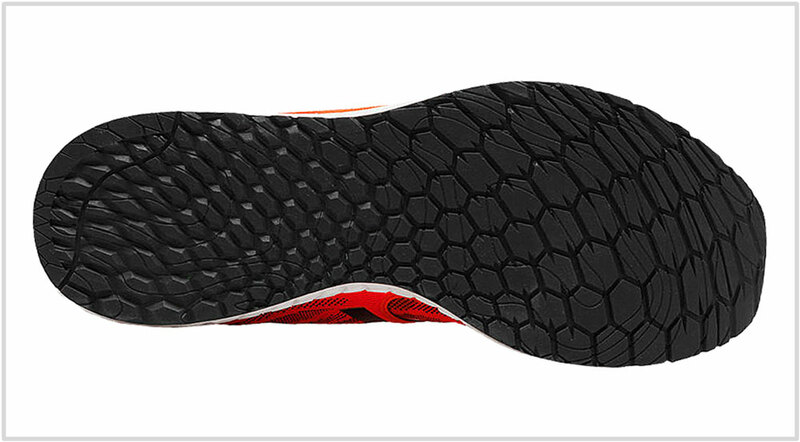 Barring a few updates, the outsole layout is similar to the V1 and V2. The heel edge has a harder compound, while the rest of the outsole has a softer rubber. The surface is covered with molded hexagonal lugs, except that orientation is sideways instead of lengthwise. On both the past Zantes, the hexagons were elongated in shape and oriented from heel to toe. This year, the lugs are smaller and densely packed together. 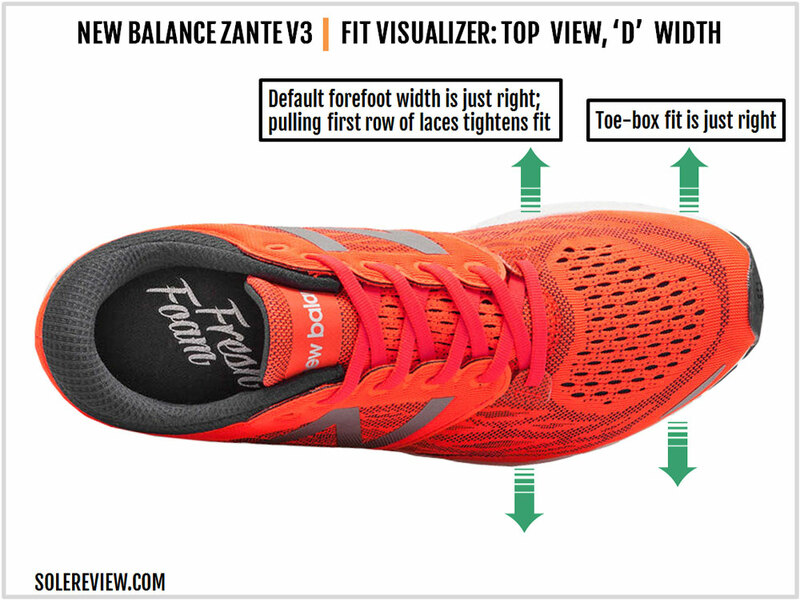 This allows the formation of flex grooves under the forefoot which makes the Zante V3 more flexible than the V2. The toe area has a high spring/raise, which is similar to the V1 and V2’s design. 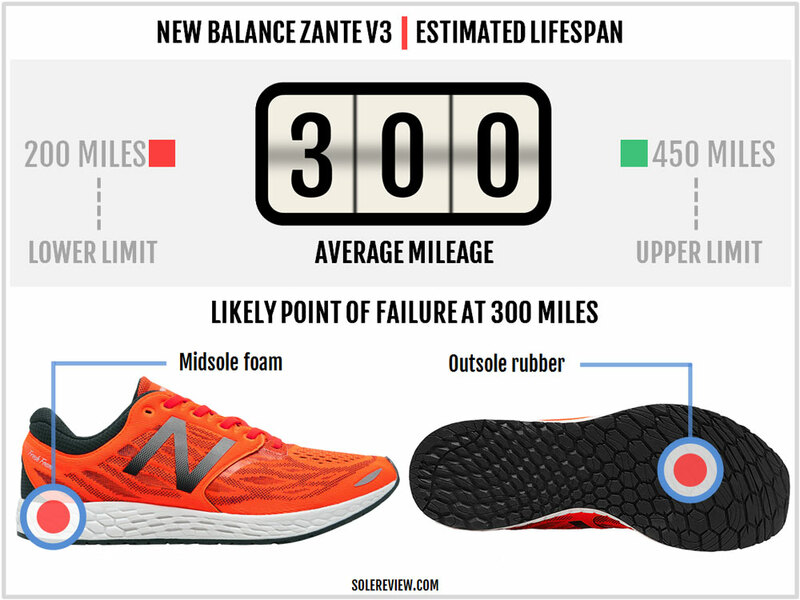 You should get approximately 300 miles out of the Zante V3. The outsole is generously clad with rubber, and the upper uses thick and durable materials. 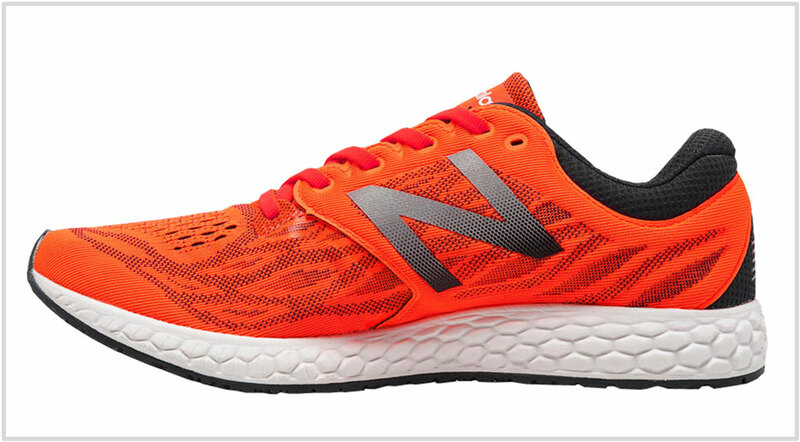 From a long-term ownership perspective, the cushioning experience will diminish over time. The EVA-based insole, lasting and the midsole will eventually lose its cushioning properties. The toe-box is wider and taller than both the Zante V1 and V2. Unlike the past two editions, the toe area is now entirely free of overlays. Also, the mesh used does not have the spongy thickness of the V2, and toe-box room is maintained by the internal toe bumper. A sleeve attaches the tongue to the upper, so the midfoot fit is smooth and seamless – just like the Zante V2. Where things have changed on the midfoot is near the top. The lacing panel is thicker than the any of the previous Zantes, and that is sensed over the foot. 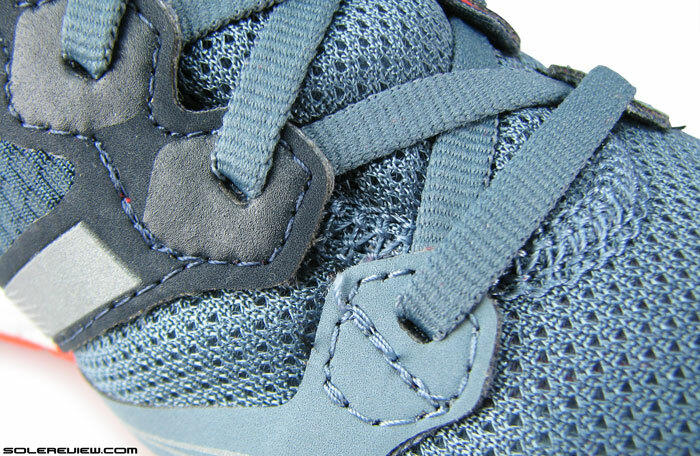 The removal of the padded strip means that the laces rest directly over the tongue. 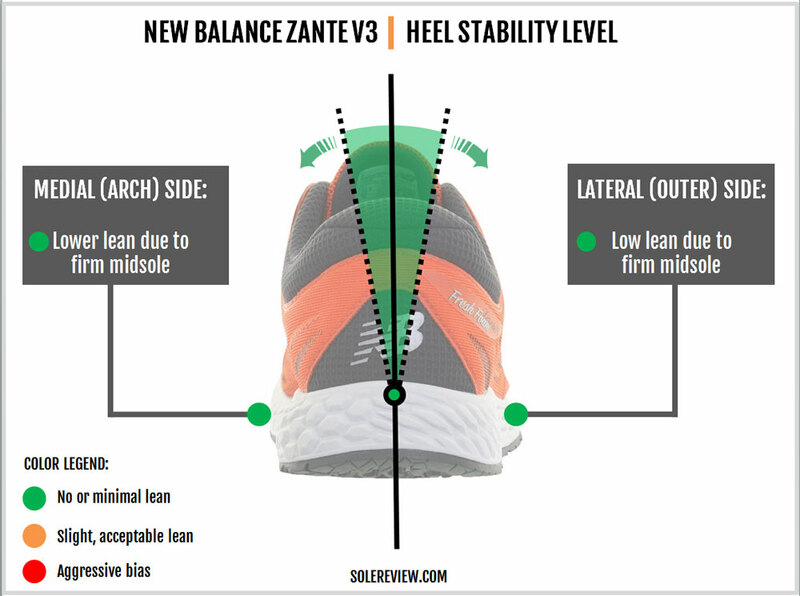 This leads to a higher level of top-down lacing pressure, a sensation which was missing on the Zante V2. The heel grips well, and as pointed out earlier, the level of foam quilting feels higher than before. The heel lacks an internal counter, hence it is semi-collapsible. While the toe area gains width due to the mesh change and toe-box redesign, the forefoot can be narrow or just-right, depending on how you lace the shoe. Since the first row of lacing is separated from the rest of the pack, it tends to apply localized pressure. If the first row is cinched loosely, then the forefoot feels wider than the Zante V2. After all, the new forefoot mesh isn’t as spongy as the V2. On the other hand, if you pull the laces tight, it will make the forefoot feel narrower. Though the effects aren’t as strong as the Zante V1, the laces do play a role in how the forefoot ends up fitting. The stitched-on midfoot panels aren’t a bother. They’re cut in a V-shape, so that relieves any potential side pressure. 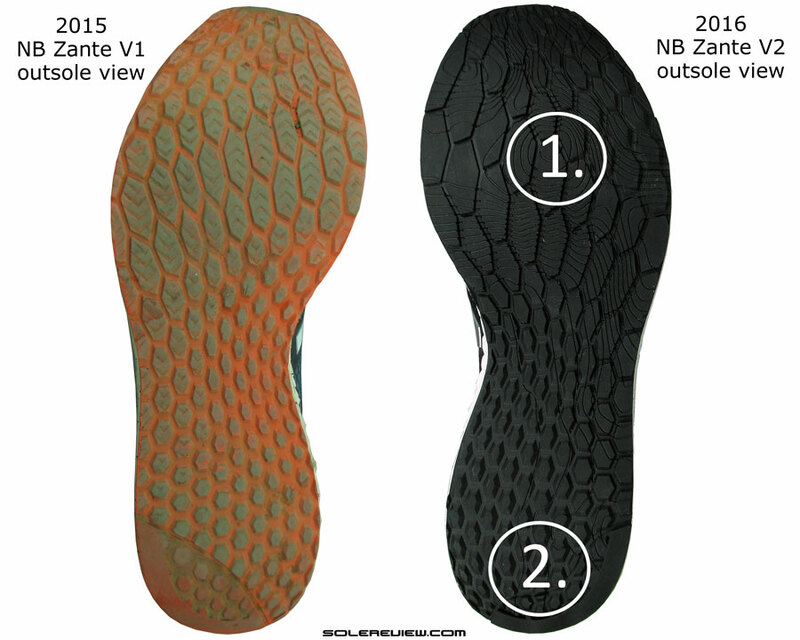 We mention this because the Zante V1’s midfoot panels did apply some pressure – but those lacked the V-shaped cut. 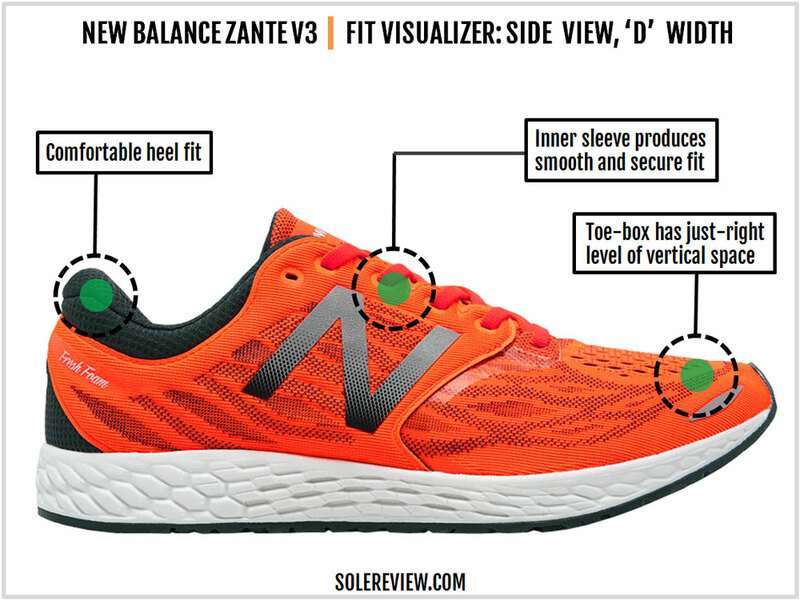 The Zante V2 was a firmer shoe than the V1, mainly because of its changed foam density and the replacement of the V1’s thicker insole with a thinner one. The same insole does duty on the Zante V3, and the midsole foam density stays the same. So why is the V3 marginally firmer than the V2? 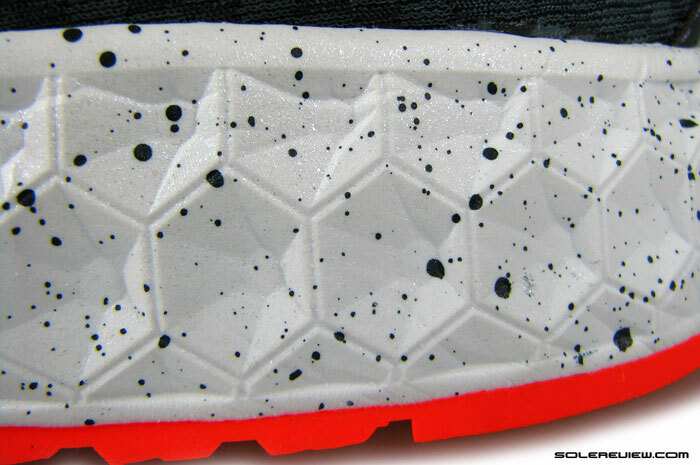 The hexagons molded into the midsole sidewalls aren’t mere decorations. They serve a functional purpose; a depressed (inward facing) hexagon is easier to compress than hexagons which are raised outwards. Both the V1 and V2 had inwards facing hexagons on the outer midsole while the V3 uses raised hexagons throughout except for a small area under the midfoot. This influences the ride quality, making the midsole a bit firmer. The bottom line is: The Zante V2 was firmer than the V1, and the V3 is even more so than the V2 – though not by a lot. So while the midsole has enough padding to get around, you won’t get the soft, cushiony feel of the original Zante. We recommend the Zante V3 to be good for anything up to a half marathon. Any longer, and you might find the cushioning level lacking. 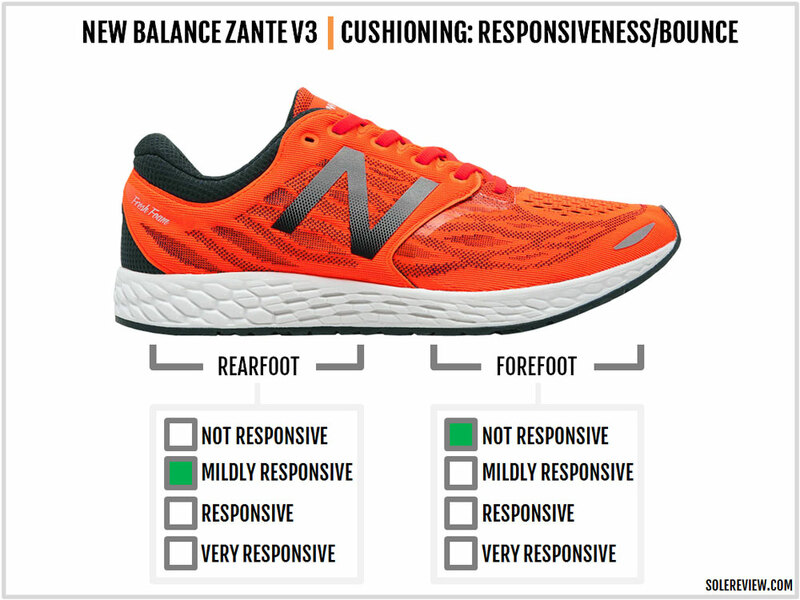 The responsive experience which made the first Zante so fun to run in is missing in the V3, as it was on the V2. The same factors which affected cushioning softness also have a bearing on the springy character, or rather the lack of it. Since the V3 sports the same insole and the foam density as the previous Zante, the amount of spring-back available is similar – which is close to none. We’ll cut some slack for the rearfoot ride experience which bears a vague resemblance to responsiveness, but the forefoot is surely flat and non-springy. There isn’t a lot midsole stack to begin with, and on top of it the foam is rather firm. This makes the Zante V3 supportive and fast to run in. The low-profile midsole doesn’t throw you around, and the consistent usage of material from heel to toe helps maintain smooth progressions. The generous rubber covered outsole helps too. The full-coverage design helps in keeping constant contact with the ground, which aids transitions and roll-offs. 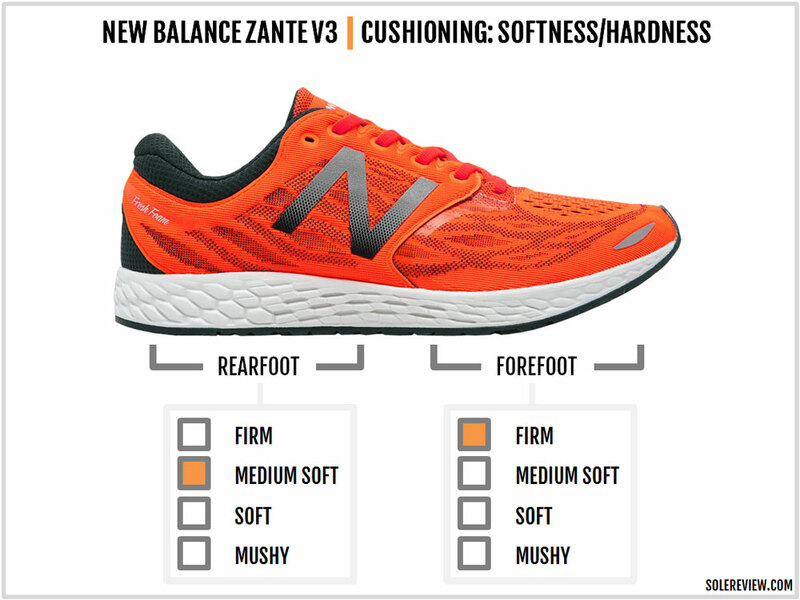 We did say that the Zante V3 might not be suited for anything over a half marathon due to the cushioning firmness, but there’s another reason. The midsole has a thin waist in the midfoot area, which means that the edges curve right under the arch. Over longer distances, this edge makes itself felt underfoot. Regardless of the updates, the core of the Zante hasn’t changed. It’s a good in-between shoe which bridges the separation between full-blown cushioned trainers and racing flats. The midsole has a smooth and consistent ride which bodes well for fast-paced training runs and even races up to a half marathon. Its sub 9-ounce weight makes it a lightweight shoe relative to the build quality. The inner sleeve ensures a smooth fit inside, and the updated forefoot area creates ample toe-box room. The engineered mesh upper breathes well. If dawn or dusk running is what makes you happy, then the Zante won’t disappoint. There’s plenty of reflective firepower available in the form of the side logos and trims over the forefoot and the heel. It’s hard to pick on a shoe which costs a sensible $100 at full retail, but if we had to change anything, it’d be the noticeably thick lacing eyestay. It just seems like too much material bunched together near the top. And can we have the ride experience of the original Zante back, please? 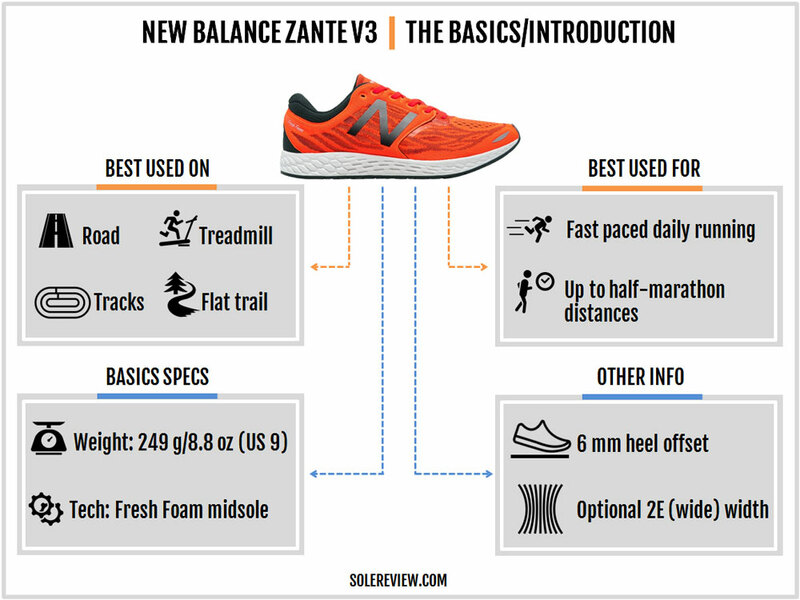 For those of you who feel that the Zante lacks the required dosage of cushioning, the more cushioned Boracay V3 is the shoe to buy. 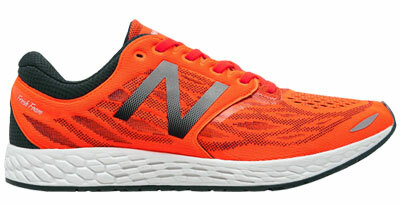 Before it was called the Boracay, the shoe was a New Balance 980. The Boracay’s midsole makes that cushioned lineage available with a 4 mm offset, and its $120 MSRP offers decent value for money. The Boracay v3’s new semi-stretch upper feels great too. The Boracay is good for long runs, the Zante for everything in between; so what of raceday use? The 1400 V4 is a perennial favorite; it combines a lightweight form factor with a padded ride and a great upper fit. If you want to add shoes from other brands into the mix, then consider the Nike Pegasus 33 as a cushioned trainer for daily use. The dual Zoom Air bags placed within a foam midsole do an excellent job of damping longer runs, and the upper fits well too. The adidas adios 3 Boost or the Nike Streak 6 are great race-day footwear in case you want to skip the NB 1400. Read their full reviews on solereview for more. There are only a couple of updates which sum up the performance difference between the Zante V2 and the V3. Due to the redesigned midsole sidewall (raised hexagons), the ride is slightly firmer than the V2. And clearing the forefoot of overlays frees up room inside the toe-box. The isolated lacing row over the forefoot has more effect on the fit quality than you realize, and this is different from how the V2 was designed. From a structural standpoint, the headline would be the complete redesign of the upper. The new design ditches the fused synthetic, and dials up the cosmetics by opting for a woven midfoot panel with inbuilt detailing. The V3 also gains a lot of additional reflectivity, with both the side logos turning shiny. The lacing panel is pretty thick, and the tongue loses the padded piece of fused synthetic. 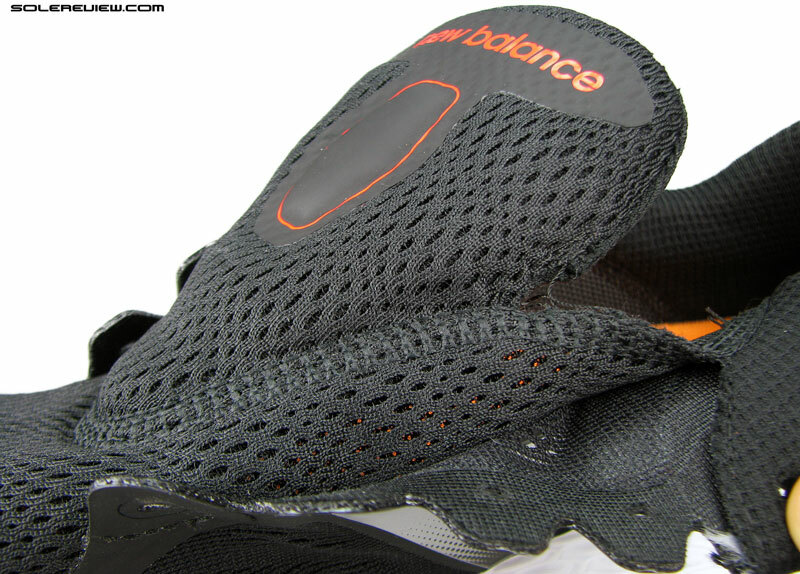 The heel padding has increased (we think), while the mesh lining material stays the same. Not a lot has changed in the weight department. There’s 0.2-ounce difference between both the versions, and that means nothing in real-world performance. 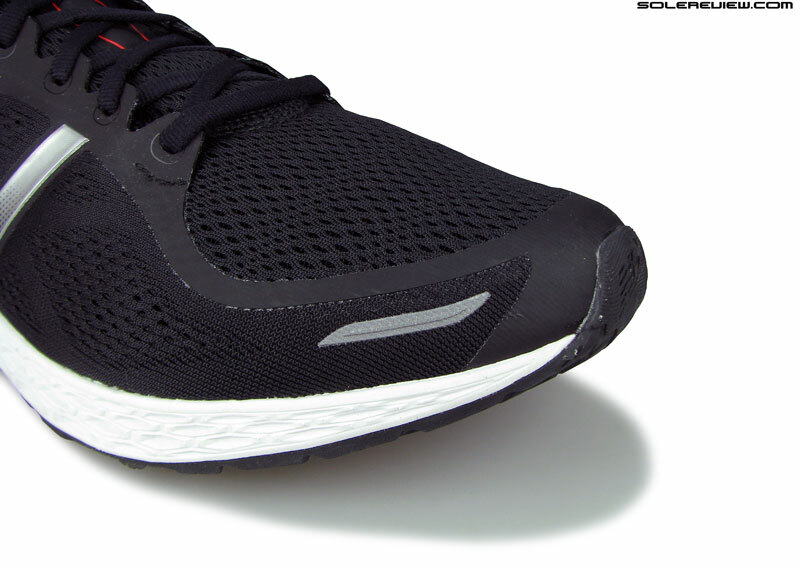 The Boston 6 Boost is the same thing for adidas what the Zante is for New Balance – a shoe which is halfway between a regular trainer and a racing flat. While the Boston weighs the same as the Zante, it has a more responsive ride, thanks to the Boost midsole. Technically speaking, the Brooks Launch 4 belongs to a higher cushioning segment. But considering that the Hyperion is too ‘racey,’ the Launch can be said to be the loose equivalent of the Zante. 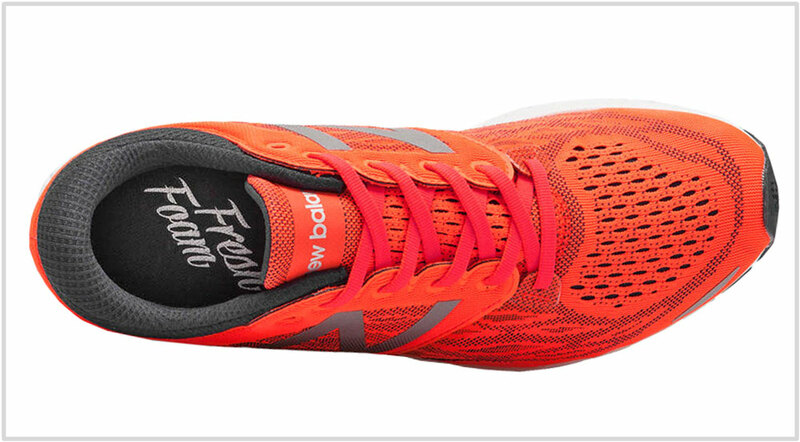 The Launch 4 does have more cushioning and has a higher heel-to-toe offset of 10 mm. The Sayonara 4 is Mizuno’s fast training shoe, lodged between the Rider 20 and the raceday Hitogami. Being a Mizuno, the Sayonara has a firm ride due to its plastic Wave plate insert. Nike has a couple of options in this category. The Nike Zoom Elite 9 is a lightweight and cushioned fast trainer which is midway between the Pegasus and the Streak. In that sense, the Elite serves a similar purpose as the Zante. But if you feel the Elite to be too much of a shoe, consider the Lunaracer 4. We would have recommended the Lunartempo, but the word on the streets is that the model is going to be retired. The Saucony Freedom ISO has a similar positioning, but its $160 MSRP puts in a different price league altogether. So the Saucony Kinvara 7 (now soon to be 8) is what you should look at. It’s got a 4 mm offset paired with plenty of lightweight cushioning. Recently, we were very impressed by the GoMeb Razor. Skechers’ newest model is the perfect middle ground between cushioned trainers and racing flats and is certainly worth mentioning in the same breath as the Zante. And what of the New Balance Vazee variants? The Pace V2 has a firmer ride than the Zante, which narrows its scope of use to faster workouts only. That said, the upper fit and feel is similar, so consider the Vazee Pace as the firmer riding version of the Zante. The Vazee Rush V2 is somewhat similar to the Zante in overall character, while the Coast V2 is more easygoing with (nearly) all-foam outsole. The medial-posted Prism V2 is a ‘stability’ Vazee, so that’s in an entirely different category.